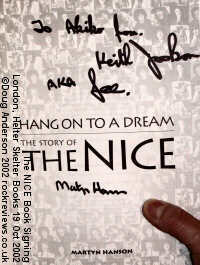 On 19 October 2002 Martyn Hanson's "Hang on to a Dream" book about The Nice had an official launch with a signing at Helter Skelter Ltd (www.skelter.demon.co.uk ) in Denmark Street, central London. 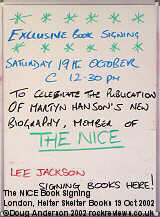 Both Lee Jackson and Brian Davison were expected to be present along with the author to sign copies but when I arrived it was obvious that only Lee had made the journey. In fact during the signing Brian phoned Lee to see how things were going - he was suffering from flu and safely tucked up at home. 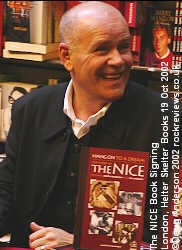 As usual I was late in arriving - I only made up my mind to go at 11am and the signing started at 12.30. Luckily I caught a fast train leaving Reading a couple of minutes after I bought my ticket. I arrived about 20 minutes after the start and there were still a couple of dozen people in the queue and others milling around having already had their copies signed. Before joining the queue I caught up with a couple of people I knew from the ELP-DISC group and was shown some impressive photos taken by Martyn Fenwick on a borrowed and expensive digital camera at the Royal Festival Hall show a couple of weeks earlier. Another list member David Bentley also had some prints with him to pass on to Lee for potential use on the live album being considered from the tour. As I turned to join the queue I was surprised to see another person I knew having her copy of the book signed. 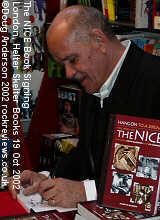 I caught part of the conversation which revolved around Lee signing the book "Keith Jackson" while talking about the third original member (also not present) Keith Emerson. With the crowd thinning Lee was more than happy to chat to fans and sign CDs and tour programmes. One other piece of interesting news I learnt was that there are plans for The Nice to present the 'Five Bridges' in Newcastle next year in somewhat different form - the Seven Bridges, two more having been built since the original piece was recorded at the Fairfield Hall, Croydon on 17 October 1969 with the Sinofonia Orchestra (a matter of weeks after Deep Purple did a similar thing with The Royal Philharmonic Orchestra at the Royal albert Hall). From the brief flick I've has so far the book seems like a godsend to fans of Keith Emerson and The Nice and will fill in a lot of gaps from the seminal progressive rock band. Before Emerson, Lake and Palmer, were The Nice. Keith Emerson, Davy O’List, Lee Jackson and Brian Davison formed a group to back soul singer PP Arnold, then riding high in the charts with “The First Cut is The Deepest.” Before long they had outgrown their place in the shadows and quickly built a reputation as one of the most exciting live bands. The Nice were one of the first groups to combine rock with classical elements, while Emerson’s habit of hammering knives into his Hammond Organ, jumping on it and even whipping it, kept audiences mesmerised. Their debut LP, The Thoughts of Emerlist DavJack, mixed rock with jazz and classical music, but it was The Nice’s hard rock demolition of Bernstein’s “America” that took them into the charts while Emerson’s habit of setting fire to the stars and stripes during the song as a protest against the US ensured a media outcry. Along the way the band had memorable encounters with Hendrix, Pink Floyd, Yes, The Bonzo Dog Doodah Band, Salvador Dali and many others. They also made some truly enduring records. Recently reformed for a series of live dates, it is time to credit The Nice with their role as a key pioneering act in the evolution of progressive rock. Drawing on years of research and hours of first hand interviews with band members and associates, Martyn Hanson sets the record straight on The Nice’s short but hugely influential career. "The Nice will be here when all the others are in Pantomime in Wolverhampton… Their influences are many, but they are indebted to no-one." 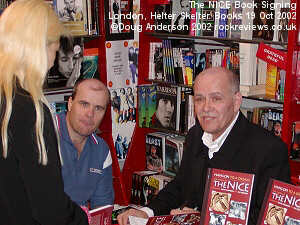 The book is available now from Helter Skelter Ltd (www.skelter.demon.co.uk ) or any good bookshop for £13.99. This page is Copyright © Doug Anderson 2000 - 2002. Created: 15 August, 2002. Last updated: 21 October, 2002.